The first thing that comes to mind with the word Pyramid is the Great Pyramid of Egypt. If you look at the image of the historical Pyramid then its base is actually a square. So, it is taken as a square pyramid and another popular form of the pyramid is Triangular Pyramid. So, what is Pyramid exactly? Let us understand the Pyramid concept in-depth throughout the article. A pyramid is a three-dimensional shape that has three sides and one polygon base. At the same time, a triangular pyramid has a triangle base with three triangular faces. This type of pyramid can have four vertices and six edges. Other than square or triangular Pyramids, the other popular types are rectangular, hexagonal, pentagonal, regular or irregular polygon etc. Most of them are named after their base. For example, in case of a regular pyramid, the base would be regular otherwise it is irregular. Let us have a quick look at components of Pyramid before we discuss on Pyramid formulas. The first component is based, second is faces (3 triangles), and the last is apex where all three faces meet. The other important measurements related to triangular pyramids are height, length, base length, or slant height etc. you should have a deep understanding of each of the terms before you start solving complex pyramid problems. There are complex pyramid problems where you need to calculate base area, slant height or perimeter etc. So, how it could be possible? This is possible by a deep understanding of basic Pyramid Formulas that allows you to get a deep understanding of Pyramid based on different parameters. To find out the surface area and some formulas can be used. The surface area of a pyramid is the total area of all the surfaces that pyramid has. Formulas to find out the surface area of a pyramid. 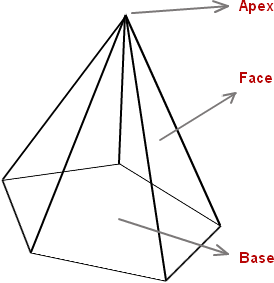 A Pyramid with a square base, 4 triangular faces and an apex is a square pyramid. b – base length of the square pyramid. s – slant height of the square pyramid. h – height of the square pyramid. Triangular pyramid is said to the pyramid where it has triangular faces, triangular. a – apothem length of the triangular pyramid. b – base length of the triangular pyramid. s – slant height of the triangular pyramid. h – height of the triangular pyramid. This pyramid has pentagonal base, with 5 sides , triangular faces and an apex. a – apothem length of the pentagonal pyramid. b – base length of the pentagonal pyramid. s – slant height of the pentagonal pyramid. h – height of the pentagonal pyramid. This pyramid has a hexagonal base with six sides, six triangular faces and an apex. a – apothem length of the hexagonal pyramid. b – base length of the hexagonal pyramid. s – slant height of the hexagonal pyramid. h – height of the hexagonal pyramid. To solve pyramid problems, this is necessary to learn analogical reasoning otherwise mathematics will just be a list of rules and formulas that can be difficult to understand by anyone. To find the solution of a Pyramid problem, if you search analogically then you could engage yourself in relevant mathematical discussion and get a deeper understanding of the concept. Why should students learn Pyramid Formulas? Students need to learn different mathematical concepts during their early school and college studies too. One of the common topics is Pyramid that is applicable to various real-life problems too. Also, students can appear for various competitive exams once they are sure on different mathematical concepts and terminologies. With a clear understanding of Pyramid Formulas, this is possible to gain meaningful insights for real-life pyramids, how they were formed and volume, surface area or slant height etc. It is further used in different domains like science, engineering, physics, and more.